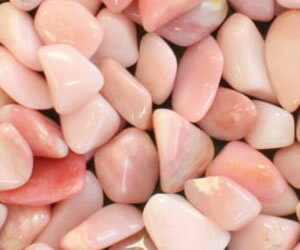 Pink Peruvian opal is fairly easy to tumble. 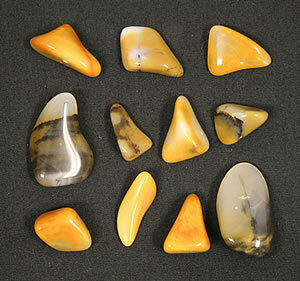 It is more durable than the transparent opal varieties and takes a great polish. Soft spots that grind away rapidly leaving an irregular surface can be a challenge. Precious opal and common opal can be shaped and polished in a rock tumbler. Be warned before you try it that this is a great way to waste a bunch of nice and often expensive opal if you don't know what you are doing or if you don't pay careful attention to what is happening in the barrel. In the article below we share a few important things to keep in mind before you try to tumble opal. Also, know this before you begin... A rock tumbler will not produce better or even equal results to what an experienced opal cutter can produce by hand on a wheel or a lap. Rock tumblers are great for cleaning up rough and polishing less important pieces. But. if you have really nice opal spend the time required to work it by hand. When you place a piece of opal rough in a rock tumbler, you lose control over the shape of the finished piece. Tumbling will not take off a tiny thickness all across the piece. Instead the grit will selectively attack certain parts of the stone. Rotary tumblers will change the shape more than a vibratory tumbler. In a rotary tumbler any protrusion, edge or point will be rounded, soft parts of the stone will be attacked more aggressively than harder areas, and any existing or nascent fractures will likely break in the tumbler. Vibratory tumbling is a lot faster and will not change the shape of the piece as severely as rotary tumbling. Most pieces of opal have areas that are much softer than others. These will cut really fast in a rock tumbler. If you tumble precious opal, the pretty fire layers can be especially soft. In a tumbler you can lose 20% of the material but 50% of the flash! If you tumble Peruvian pink opal, the lighter color areas can wear away quickly and will often produce an irregular instead of smooth surface! 3) You Will Lose Weight! Expect to lose 25% or more of your weight in the tumbler. If you place a three-gram piece of opal in a rock tumbler, you might have a two-gram piece of polished opal (or smaller) after the polish. If you are buying really high-quality material, you might want to do the cutting by hand to control the shape and depth of cutting. You can always do the rough cut on a grinding wheel and do the fine grit and polish in the tumbler. We polished some fluorescent opal from Virgin Valley Mines near Denio, Nevada. It has a nice cream body color in normal light and a strong green glow under short-wave ultraviolet light. Some pieces of mossy opal were also highly fluorescent. 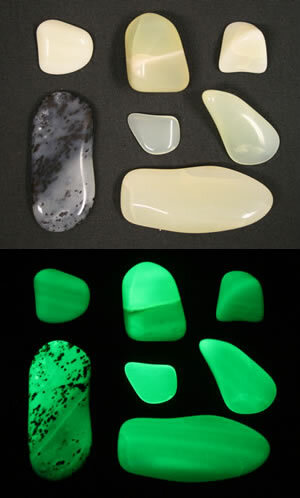 More about fluorescent opal. Opal is soft (about 5.5 on the Mohs scale). If you don't have enough for a full load, consider tumbling it with pieces of obsidian that are about the same size and shape. (Know about how obsidian produces gas before you start). Obsidian has a Moh's Hardness similar to opal's and will round at the same rate. We usually use small broken-in ceramic cylinders because they improve the tumbling action, they don't break and they have blunt edges. Because opal is soft you have to keep an eye on it in the tumbler. It can grind away to nothing if you let it go too long. If you are using a rotary tumbler, open the barrel every couple of days to see what's happening. In a vibratory tumbler check at least once every few hours until you get to know your material. Being lazy can cost plenty! Opal is soft and it lacks "toughness." Hardness is the resistance to being scratched, but toughness is the resistance to breaking. If you don't fill your tumbler to capacity, your opal could be tossed around violently in the barrel. Some opal also suffers from "crazing". Crazing is the development of small cracks that extend deep into the opal over time. Eventually they intersect and the opal breaks up. If your opal is crazed the tumbling will complete the process and you will end up with lots of tiny pieces. Phooey! To avoid this problem be sure that your rotary tumbler barrel is at least 2/3 full and you have small material in the barrel with the opal to fill empty spaces between the stones. We use small-size filler such as obsidian or glass that is the same size or smaller than the opal pieces. Small ceramic cylinders work even better. These will cushion the opal in a tumbler. Don't tumble large pieces of any other type of rough because big pieces in the barrel produce hard impacts that can chip, crack or break your opal. Here is some mossy and honey-colored common opal from Virgin Valley Mines, Nevada. This material polished to a really nice finish but had lots of fractures. Coarse grit aggressively attack soft spots while medium grit results in a more even (but slower) removal of material. For gentle removal start with medium grit silicon carbide (about 150/220). Then use 500 or 600 grit silicon carbide for the fine grit step. For polish, we have great success on many types of common opal with TXP aluminum oxide and cerium oxide. We can't say enough about this. Don't load $1000 (or even $20) worth of opal in the barrel and hope for the best. Get lots of experience tumbling soft, easily-bruised materials such as Apache tears or obsidian. When you can get a great polish on that without producing chips and bruises then you are ready to try some inexpensive common opal. A noob with a tumbler and a bunch of nice opal will become a noob with a bunch of damaged opal. Open the barrel frequently to see how things are going. If you grind too much off you can't put it back on! If you see your rough starting to chip or bruise, add more cushioning, slow down the action, or add a shot of Dawn (see Tip 11). Some common opal does not have a base color or a body color. 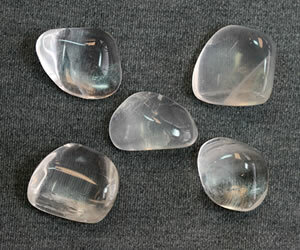 Instead, it is a clear material known as "water opal" and "hyalite." We found that it was really easy to tumble. No problems with fractures or bruising. If you have a lot of rough and it is dirty or surface-stained, a short tumble in medium grit can clean it up nicely. The tumbling can reveal the potential of a piece of opal or reveal its problems. You might be amazed by how much work this can save. Lots of opal mines in Australia take their run-of-mine material to an "opal washer" which is really like a giant concrete mixer that tumbles the stones for a couple of days, washing off the mud, smoothing sharp edges and making color easier to spot. 10) Do You Have a Diamond Wheel? I tumble opal for a couple of days and then examine it to see how it is progressing. This cleans it up, reveals some of the hidden flaws and grinds off the sharp edges. I then work the really nice pieces by hand on a grinding wheel. This allows me to carefully grind away boulder, bruises, soft spots and bring nice color close to exposure. After hand work on the wheel the stones should be ready for a very short tumble in medium grit, or go straight to fine if the pieces don't have a lot of wheel marks on them. We sometimes use one shot of Dawn Direct Foam detergent to create a cushioning bubble froth in the tumbler. Although it slows down the cutting action it's great for cushioning. It also decreases the amount of noise produced in some vibratory tumblers. Don't use more than one shot or you might have a huge foamy mess to clean up. For cushioning during the fine grit and polishing step we use LOTS of small ceramic media. Your opal should be swimming in small ceramic media or other smooth tiny rough. Don't tumble opal in a barrel with larger material because it will damage your opal. We use small broken-in ceramic media in both rotary and vibratory tumbling. Tiny soap bubbles can add a little more cushioning if added to small ceramic media. We have used them in rotary and vibratory. They slow down the cutting but they also reduce impacts. 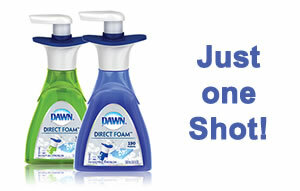 We sometimes cushion with one shot of Dawn Direct Foam soap. One shot will add a million tiny bubbles to the barrel. Two shots will create a huge foaming mess!